United Cerebral Palsy provides a specialized, door-to-door transportation service after 5 pm during the week and all day on the weekends for our members. 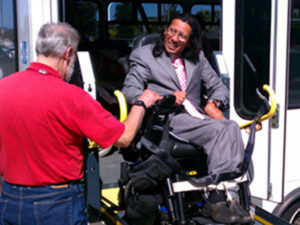 As one of our first provided services, CIP Transportation was historically created to help people with disabilities gain independence and further access to our community in the evening hours and weekends. To book a ride, we invite you to call our office at (805) 543-2039. We ask that to guarantee your ride’s availability, please call at least four days before you need the ride.